The jet lag over the course of the first week was getting better, at least for us. Malcolm, who sleeps most of the time, still had his days and nights flipped. His night time sleep is pretty solid. We might find him in a slightly different place or position than we left him, but not far. We've also taught him to sleep in. Unless we're being exceptionally lazy, usually on a weekend, we have to wake him to get him going in the morning. If we are being lazy, he'll jump up onto the bed with us to say good morning, sometimes to play, sometimes to be lazy and snuggle with us instead of on the floor. He generally isn't allowed to sleep on the bed with us, but slow weekend mornings have become the exception. And when Blake is gone, he is neither encouraged nor discouraged regarding sleeping on the bed. 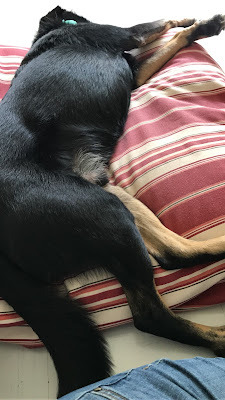 During the day, when we're home to observe this, he takes several different naps - getting up to stretch, drink water, play a little, or move to a completely different spot anywhere in the house. For our first several nights in Japan, he clearly increased in energy in the evenings, instead of slowing down. It was not uncommon for him to be heard wandering about in the dark after bedtime, his tags jangling. And every morning between 3-4AM, he would jump on to the bed on top of us, ready to play. 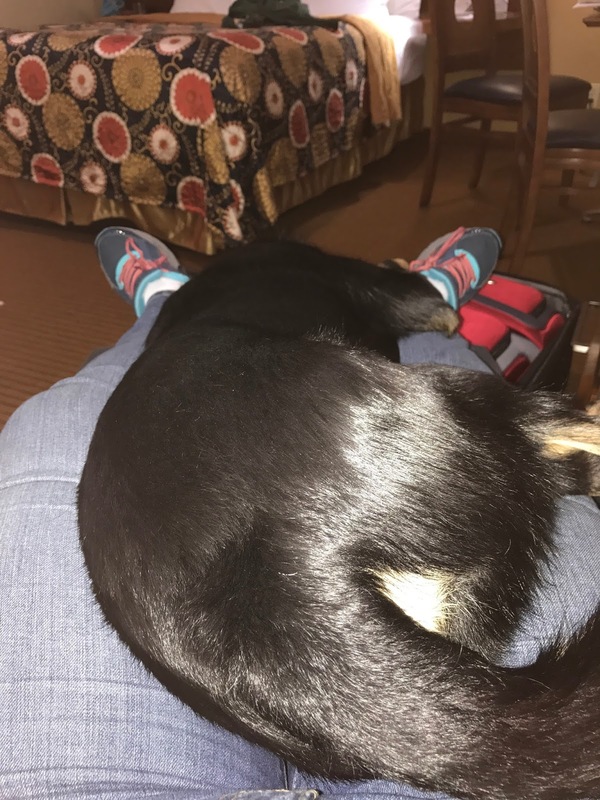 We'd push him off and try to get another hour's sleep if we could, but then we would get up and take him on a walk to the on base dog run about ten minutes from the Lodge. Malcolm enjoys a toy he found at the base dog run. When we left for the day, he would have to go in his crate, and he definitely didn't like it, but he got a little better about it everyday. 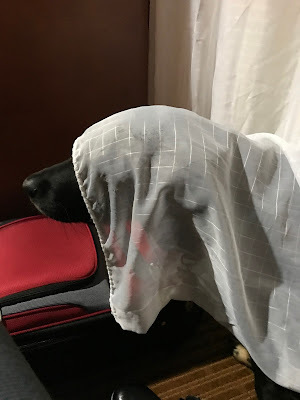 He was crate trained at home, but that's different from the travel crate he had to spend an inordinate amount of time in and our old apartment is more familiar than the hotel room, so his distress was understandable. We frequently got some very serious snuggles when we got back everyday. He snuggled here for almost two hours one day. In time, his schedule straightened out. 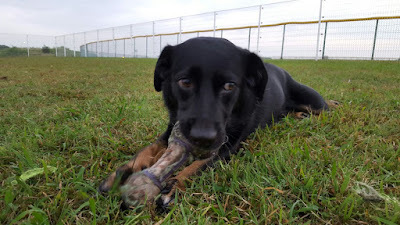 We live in a housing detachment away from main base, but we still have a dog run (a bigger one, even) about ten minutes away, which we use just about everyday. He sleeps on his bed at the foot of ours every night, and he only jumped on us this morning because we opted to sleep in an extra 20 minutes. As soon as we put new pillows in his pillowcase, he was ready to sleep on the bed that smells like him. Malcolm is still in quarantine for a few more weeks, but once he's free, we have several nearby hiking trails and even a dog friendly beach within walking distance! We have even figured out a place he will reliably do his business, something he is notoriously picky about! It wasn't easy getting him here, but he's settling in nicely and will likely have a great time living here! Poor guy. It's hard when you can't explain what's going on to a family member. Hooray for teaching him to sleep in! It's so helpful when those who depend on us don't do so super early in the morning.